Any work product purchased from or otherwise provided in any way by OnPoint Legal Research Law Corporation does not constitute legal opinion or legal advice and is prepared solely for review by the lawyer who requested the research. That lawyer is ultimately responsible for the work product that they submit on behalf of their own clients. In order to contract for the services of OnPoint Legal Research Law Corporation, a lawyer must sign a research agreement. All research agreements will be between the lawyer requesting the services and OnPoint Legal Research Law Corporation. Our researchers are retained as independent contractors. Our independent contractors are all members of the Law Society of British Columbia and they carry practice insurance. 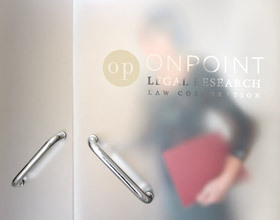 OnPoint Legal Research Law Corporation provides top-quality research, analysis and writing to lawyers. However, OnPoint Legal Research Law Corporation provides no warranties with regards to our services and any liability is limited to the cost of the services provided. OnPoint Legal Research Law Corporation will not be liable for any consequential, punitive or special damages. The content of this website and of the sample memoranda do not contitute legal advice and are not to be relied upon for accuracy or currency. Memoranda are included only as examples of writing style. OnPoint Legal Research Law Corporation will not be held liable in contract, tort or otherwise for for any loss or damage which may arise from access to or any use of hte information and material contained on this site or any site that may be accessed through this site. An order submitted through this site by use of the Research Request Order Form is only a request for services. We do not accept the order or agree to provide the requested services until we have sent a final written confirmation of the terms, conditions and estimated costs of the order, and the client has agreed in writing to those terms, conditions and estimated costs.